In the epic battle for superhero cinematic supremacy, Disney’s Marvel Entertainment rules over all. Franchises like X-MEN, IRON MAN, AVENGERS and GUARDIANS OF THE GALAXY have all raked in huge amounts of money while Warner Bros. owned-DC Entertainment’s recent films – BATMAN VS. SUPERMAN: DAWN OF JUSTICE and SUICIDE SQUAD – have failed to crack the billion dollar box office holy grail. If DC is going to stay in this game, they need not just a hit but a super-colossal megahit. Fortunately for them, they got one just in time with WONDER WOMAN. Fans of the DC Extended Universe have already seen the Amazon Princess (Israeli actress and model Gal Gadot) in the aforementioned BATMAN VS. SUPERMAN: DAWN OF JUSTICE, which came out last year, but now, with the film WONDER WOMAN, we are given Diana’s genesis story. In case you’re not up on it, here’s how it goes: Diana lives on Themyscira, a cloud-enshrouded island presumably in the Aegean, along with a tribe of Amazon women who are led by Diana’s mother, Queen Hippolyta (Connie Nielsen). Although Diana is the only child on the island, no one, least of all Diana, seems to think it strange. Diana, for her part, dreams of one day of becoming a fierce warrior like her aunt, General Antiope (Robin Wright, TV’s HOUSE OF CARDS). As she grows up, Antiope begins to train her, much to the disapproval of Hippolyta, who fears that Diana’s innate powers will come to the fore and Ares, the god of war and the last surviving god of the Greek pantheon, will find Diana and try to kill her. Why Ares would do that is revealed in the film. In this story, the women’s idyllic existence comes to an abrupt end when a WWI German plane crashes into the sea off the island’s coast. Diana, who happens to witness the crash, dives into the water and rescues the pilot. Unfortunately, hot on his tail is a fleet of German warships which also break through the island’s cloud cover, bringing the fighting to Themyscira’s shores with devastating results. With the pilot as their prisoner, the women use their Lasso of Truth to learn that he is Steve Trevor (Chris Pine, HELL OR HIGH WATER; STAR TREK BEYOND); JACK RYAN: SHADOW RECRUIT), an American spy assigned to the British. He has some intel on Germany’s new secret weapon and needs to get back to London to inform his colleagues. Sure that Ares is behind this war, Diana decides to leave the island with Steve, intending to find the Greek god and kill him, thereby stopping the bloodshed and bringing peace back to the world. Steve, meanwhile, doesn’t know what to think but he agrees to take Diana with him if it means he can leave. Considering much of the target audience for this film weren’t even born at the time of the Gulf War, choosing to set this film’s timeline one hundred years ago was a risky proposition. Fortunately, first-time superhero movie director Patty Jenkins (MONSTER) was given an exciting script with fleshed out characters throughout, and she does both it and the writers (led by Allan Heinberg, TV’s GREY’S ANATOMY) proper justice. There aren’t many surprises in this story – perhaps even none at all – but it moves along at a good pace and everyone is interesting to watch and believable. 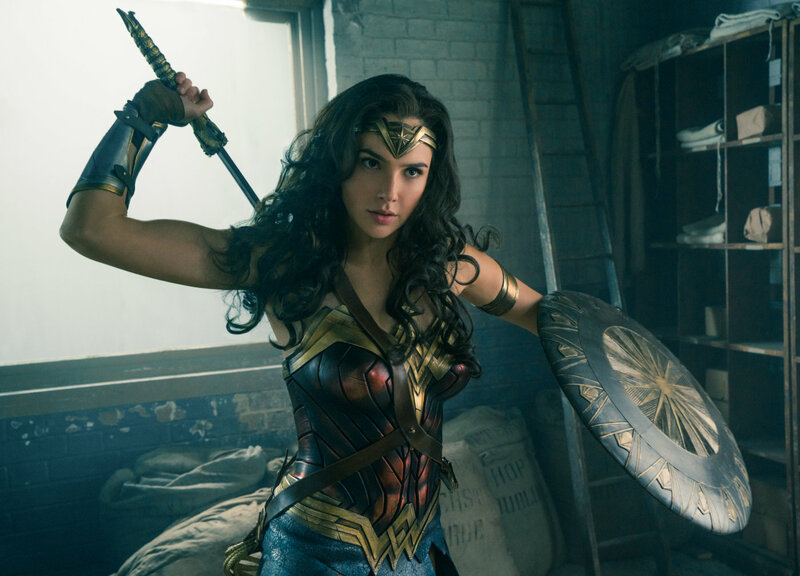 The biggest key to the film’s success, though, is the doe-eyed Gadot who plays Diana with an harmonious balance of innocence, femininity and strength. Although the actress had to undergo months of rigorous training to prepare for the role, thankfully she didn’t turn into a musclebound she-hulk in the process. Diana has curves in all the right places, and exudes both female sexuality and power. Much like actress Lynda Carter (TV’s Wonder Woman) was an icon for both young girls and pubescent boys back in the 1970s, Gal Gadot is almost certain to become the cultural icon for this generation. Expect to see her posters tacked on kids’ bedroom walls very shortly. If DC Entertainment is smart, they’ll limit her participation in superhero ensemble films (such as JUSTICE LEAGUE, which is due out in November 2017) and focus just on Diana’s adventures. Pine, for his part, puts in another solid performance here as Diana’s dashing foil. His character seems a bit too James T. Kirk-like for 1918 but that’s a minor point. He’s enjoyable to watch. Danny Huston, who seems to relish playing villains (he was also Colonel William Stryker in X-MEN ORIGINS: WOLVERINE), is fine as the German General Ludendorff, the man behind the secret weapon, though perhaps his character should have been more sadistic than the way he portrayed it. David Thewlis (ANOMALISA), who plays Sir Patrick Morgan, a member of the Imperial War Cabinet who helps Steve and Diana try to stop Ludendorff before it’s too late, may not have been the best casting choice though. The character needed to have someone who has more acting gravitas than Thewlis could muster. Someone like Kenneth Branagh or Sean Bean may have been more suitable. All in all, WONDER WOMAN is the kind of summer blockbuster that both BAYWATCH and PIRATES OF THE CARIBBEAN are not. If you’re going to spend your money on a film this summer, this is the one you should be seeing. I saw it in IMAX 3D, though I’m not sure if it’s worth seeing it in that format. Regular 3D, or even 2D, should be fine. I saw it a few days ago and it definitely lived up to the hype! Even if I wanted to complain about it the only things I didn’t like were super minor (like that mustache at the end…. so distracting).